June 12, 2018 0 comments on "Growing Bean Sprouts in a Jar"
It’s satisfying to grow your own food at home, and there are many ways you can do that. You can plant a garden, whether in your backyard or in containers, and you can even grow plants on your kitchen counter! Growing bean sprouts is very easy and they are ready to eat in just a couple of days. I’ve tried growing alfalfa sprouts in a jar before, and they turned out great. Those sprouts are great for salads. Recently my teenage boys have become interested in learned how to cook some different Chinese and other Asian dishes, and a lot of recipes call for bean sprouts. Bean sprouts aren’t all that expensive, but I got to thinking that these sprouts have to be similar to other sprouts you could grow, so there had to be a way to grow them at home. I went to my local health food store to ask them what kind of bean sprouts were used in Chinese cooking. They told me that they were sprouts grown from Mung bean seeds. They had some at the health food store, and you can also order Mung bean seeds online from Amazon. I was really excited to find out we could grow our own bean sprouts from home. It turns out it is much less expensive to grow them yourself, you only need 4 tbsp. of mung beans seeds to grow 3 cups of bean sprouts! 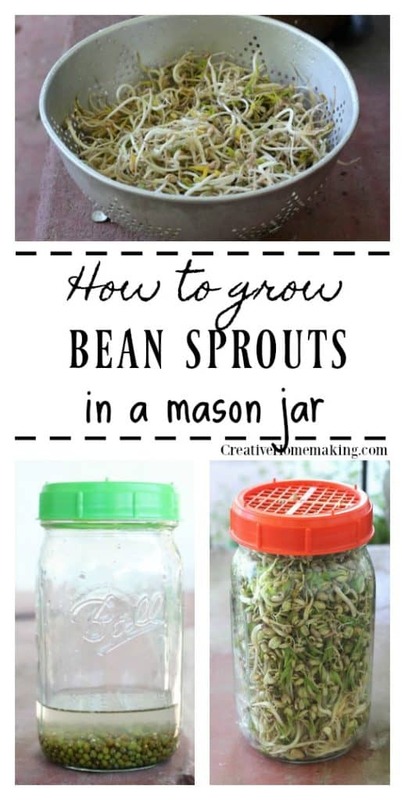 You will need some sprouting lids to put on top of your mason jar. Cheesecloth can be used in place of the sprouting lids, but the lids are very inexpensive and you can use them many times to rinse your beans. You will have to replace the cheesecloth more often. You will only need 4 tbsp. 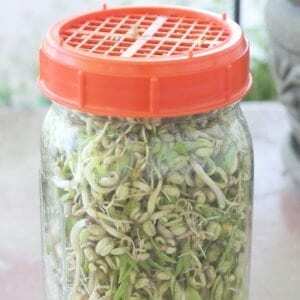 of mung bean seeds to grow 1 quart jar of bean sprouts. The directions that came with my sprouting lids say to add 1 part seeds to 4 parts water, so I placed 4 tbsp. seeds in my mason jar and then added 16 tbsp. of water. Place the lid with the smallest holes on the jar first, you will use the one with the large holes later after your sprouts start growing. Let your bean seeds soak overnight in the jar. Recommended soak time is 6-8 hours. In the morning, fill the rest of the jar with water by just letting more water from the faucet run through the screen on top of the jar. Pour all of the water out of the jar through the screen. FIll and rinse one more time. For the next several days you want to rinse your seeds several times a day, at least twice a day. The sales person at the health food store told me that if you rinse them three times a day they will grow even faster. Make sure each time you rinse them that you pour all of the water out. The seeds will start to sprout with no water in the jar. It is recommended that you prop the jar sit upside down, at an angle so that any water can drain out. I decided not to do that, I just made sure I drained the water really well. As the seeds start sprouting, they will start shedding the hulls of the seeds. When you see that happening you can switch the screen lid on the jar to the lid that has larger holes. This will allow you to rinse away the hulls while you are rinsing the sprouts every day. It only takes 3-4 days for the sprouts to be ready for harvest. That is fast! I don’t know of any other food you can grow that you can harvest so fast. I actually left my sprouts in the jar a day or two too long, that’s why there are little leaves growing on my sprouts! There shouldn’t be any leaves growing on them yet when you harvest them. If you do end up with the leaves, however, you can either just eat them or pull them off. When you are ready to harvest the bean sprouts, give them one good last rinse with cold water. Bean sprouts can be kept fresh by storing them in the refrigerator. They will stay fresh for at least a week. This was a fun activity for my family, and we will definitely be doing it again. There are many different kinds of sprouts you can grow. Amazon has many different types of seeds you can sprout in your kitchen.